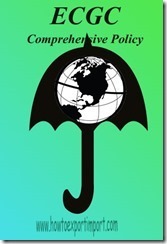 Comprehensive policy is one of the popular risk cover policy of ECGC Export Credit Guarantee Corporation. ECGC functions as a service provider to exporters in extending credit worthiness of buyers. ECGC assures amount of consignment on default of payment by buyer. ECGC collects premium against such insurance cover. 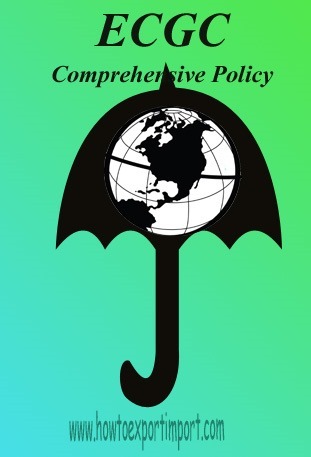 One of the major insurance policies of ECGC is comprehensive policy. You are an exporter, you obtained an order from XYZ - an overseas buyer to ship them goods for 6 months for USD 6000 (us dollars six thousand). The buyer instructed you to ship goods worth USD 1000 (one thousand) per shipment, each month. Means, you ship six times in each month for USD 1000 per shipment and total of USD 6000 for six months. As per the agreed terms by you and your buyer, credit period you have allowed is 60 days D.A.P (DA). Means, 60 days from the date of particular shipment, your buyer has to pay the amount of USD 1000 to you. Again in next month the buyer has to pay USD 1000 against the second shipment you have shipped to your buyer. the total outstanding liability of existing buyer ( XYZ ) should not exceed the limit of USD 2000 at any point of time. Read this sentence once again to make clear about how does comprehensive policy of ECGC work. Based on the above example, let us learn the procedures to be followed while shipping goods. As per the example, you effected 1st shipment on 10thof April. Once after shipment, you have sent all required shipping documents with original bill of lading or airway bill with bill of exchange for acceptance though your bank to buyer’s bank. Documents reached buyer’s bank and buyer accepted documents. The due date of payment falls on 10th June. You have effected second shipment on 10th May worth usd 1000 as per your purchase order. The due date of this 2nd shipment falls on 10th July. Please note, your total outstanding liability at present is USD 2000. Remember, you have an approved limit of USD 2000 against this particular buyer. Your 3rdshipment is expected to effect on 10th June. Once you ships 3rd shipment, the total outstanding liability would be USD 3000, which is not permitted by the ECGC. However, the due date to receive the export amount under 1st shipment is due on 10th June. In this case, you are not supposed to ship 3rd shipment. You can request buyer to allow you to ship 3rdshipment, once after receiving the payment for the 1st shipment. Also read - ECGC Claim – Is it a Hurdle? What does ECGC do on default of payment of any overseas buyer? Difference between EPCG and ECGC What is ECGC and how does ECGC protect exporters? Have you satisfied with this article explaining the functions of Comprehensive policy of ECGC? So, comprehensive policy of ECGC replenishes the credit worthiness of buyer, once after realization of export proceeds against the outstanding. Would you like to share your experience in handling comprehensive policy of ECGC? Share below your thoughts and knowledge about comprehensive policy of ECGC. Comment and discuss below about his article – How does Comprehensive policy of ECGC work? What is ECGC and how do ECGC protect exporters? Roshan Kukade: On 27 February 2014 Thank you for your valuable information ,as i am new in this field, your valuable articles helping me for clearing my doubts. Rubal: On 03 February 2015 Hello, thank you for this information. Could you please share with us the difference between ECGC and EXIM Bank? How do they respectively facilitate international financing of trade ? ajit: On 03 December 2015 Can bank give loan on ecgc certificate and if yes how muuch % DOES IT GOVE TO THE EXPORTER? ?